Login to the TDS software. Add a new deductor or work on the TDS Return of a previous deductor. 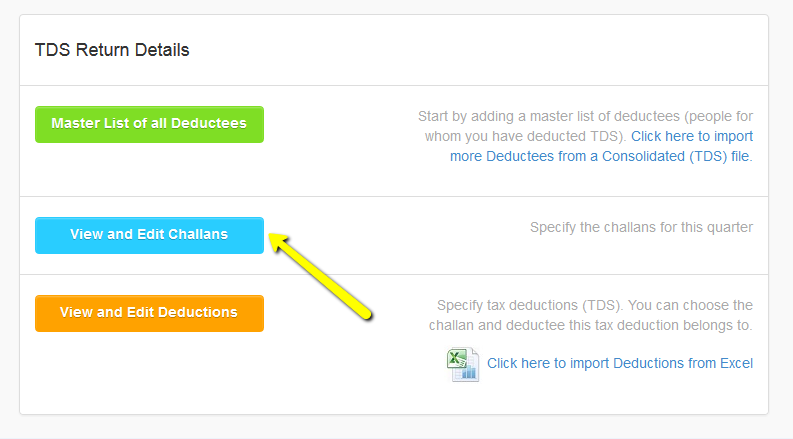 In the TDS Return Details section, click on View and Edit Challans. Remember not to add any amounts for TDS. Please note that the department does not allow nil challans without specifying tax deductions anymore. You will need to specify some tax deductions associated with the challan. Also, since these deductions will be for zero TDS amount, you will have to select a Reason for Lower Deduction in the tax deduction. Otherwise, the FVU file won't be validated by the department's FVU utility, and TIN-NSDL won't accept it.